Sing and Celebrate 6! provides everything you need for developing younger elementary choirs in your church! 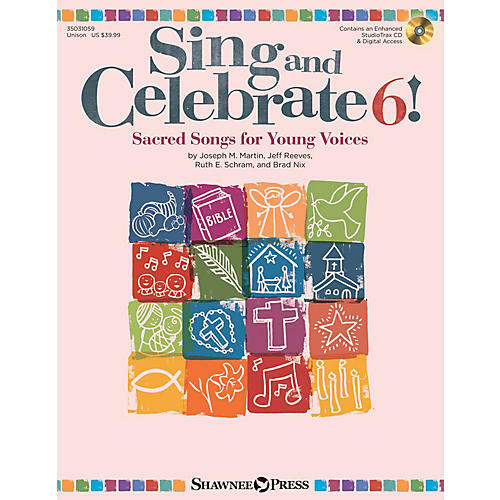 Designed for grades K-4, Sing and Celebrate 6! contains a variety of general and seasonal songs for use throughout the church year. Packed with lesson plans, teaching resources, and rehearsal planning ideas, this collection gives you all the tools necessary for building a successful, engaging choir program in one value-packed Book/CD! The enhanced StudioTrax CD features accompaniment and performance tracks, along with reproducible singers' pages, supplemental teaching resources, and colorful PDF song charts for projection options! NEW in Sing and Celebrate 6! - all resources found on the StudioTrax CD can now be downloaded online! Songs, both familiar and new, along with fun, creative teaching plans will nurture the musical and spiritual growth of your singers to last a lifetime. Songs include: Look Who God Made! (General), My God Is So Great (General), Praising You, Lord (General), The Colors of Life (Thanksgiving), Who Are We Waiting For? (Advent), The Friendly Beasts (Christmas), Ring and Celebrate! (Christmas), Help Me to Be Like You, Lord (Lent/General), Sing, Sing, Sing (Easter), God, Bless Our Family (Mother's Day/Father's Day/Family). Also available in the Sing and Celebrate! series: the original Sing and Celebrate! (35028238), Sing and Celebrate 2! (35028755), Sing and Celebrate 3! (35029219), Sing and Celebrate 4! (35029809), Sing and Celebrate 5! (35030476) ScorePlay - click to view score with recording.